Plantronics S11 Telephone Headset System offers hands-free convenience and comfort, and includes an over-the-head headset for stability with a noise-canceling microphone for superior sound clarity. It's the most affordable of all Plantronics headsets. 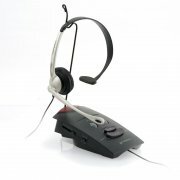 Plantronics S11 is the very popular among call centers around the world where large deployment of headsets are needed..